Vision Management are the management company in control of day to day running, any issues or questions relating to The Axis Development please contact Vision on 08454568775 during working hours 9am-5pm Mon-Fri. If you wish to Sell or Let your apartment please make sure agents are aware of Access Rules this is a private development as such require appointments to be made in advance with concierge or site manager. There is a NO SMOKING or VAPING (Electric Cigarettes) in communal area's policy in place at The Axis, you will also notice no smoking signs around Romford underpass between the Market, Library and Liberty . There is a smoking area at entrance area at reception. There are 82 private car parking spaces secured within the Axis (electric doors at rear, fob key required) check advertise page to check if any for rent! Visitors to the Axis can park in the town hall which is free after 7pm weekdays and all day Sunday or park in the Asda car park, no visitor parking at the Axis.You will receive a parking ticket if you do. The rear entrance / exit is NOT a common walkway, it is for vehicle and cycle use only, you need a fob to open the electric gates or call concierge. For your own safety do not use this as an exit, use the main entrance at front, beside Asda, only in case of emergency can Holly Court be used as an exit. There are Maxim Tower, Exon, Lexicon, Axiom, Zetex, Index and Holly Court within the Development. All workmen / inspectors must report to concierge office on arrival to sign in / out and collect parking permit. The Axis has 24 hour Concierge service and has CCTV (recording & monitoring) at all times including Audio at reception for residents and staff safety, security and good management. The Axis Development can be found in the heart of Romford, across from Havering Town Hall on Main Road (RM1) with access to the rear via Junction Road and Dolphin Approach. The perfect site for shops as the development was built on top of the Liberty / Mercury Mall under cover shopping centre. The Police station is nearby as is Queen's Hospital. Romford overland mainline station is a 5 minute walk and takes less than 20 minutes to Liverpool st. There is a very good bus service on your door step. Raphael Park is a 5 minute walk where you can have a pleasant stroll, feeding the ducks and geese or if you feel a bit more sporty there are tennis courts just through the park. Lodge Farm Park has a Lawn Bowling club the club is very successful with quite a collection of cups / trophies that they have won since the late 1800's. They welcome new members, have a smart clubhouse with subsidised bar. We also have Romford Library just a stones throw away, the Library was recently refurbished and is situated via the underpass outside the main entrance to the Axis, beside the town hall. NEW 16/12/2015 Now have fibre optic installed throughout the Development !!!! or placed under residents front doors, if you wish to advertise contact details are below on the footnote. 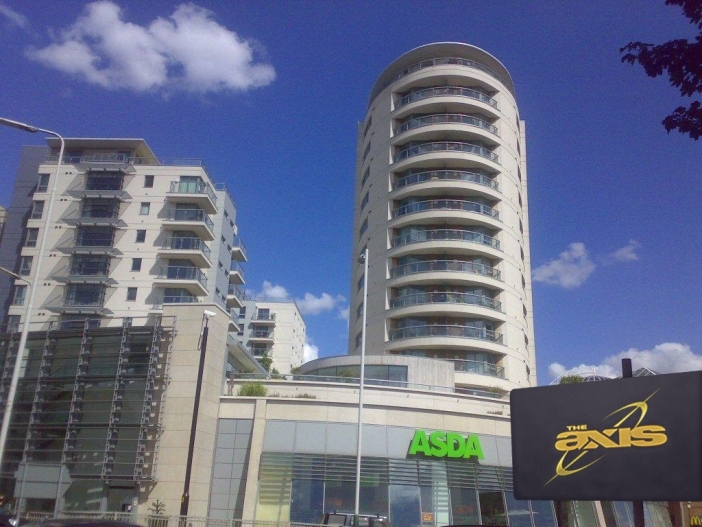 *for Leaseholders that have not signed up to "Axis Residents Association"